Two of the most important aspects of your campaign are the CPC (cost-per-click) and Budget. Our quick video details the importance of these values and how to set them up in your dashboard. The CPC is the amount of money you are willing to spend per click on your content. The budget is the amount of money you’re willing to spend each day on clicks. Setting up your campaign with a competitive CPC and budget from the beginning will bring you closer to your content strategy goals more quickly. When launching your first campaign, you will be prompted to enter your CPC, budget, and budget type. 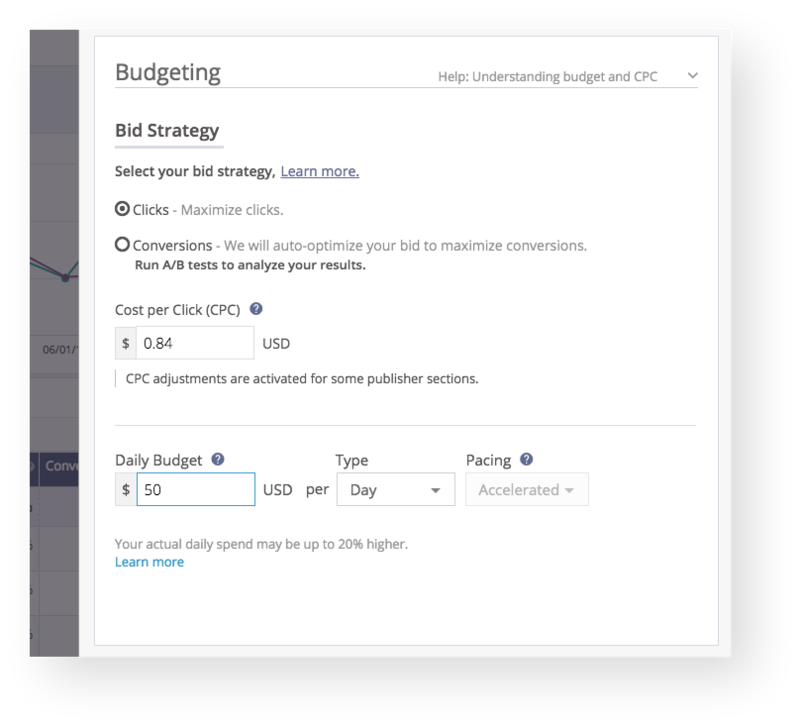 Once in the dashboard, you can edit your CPC and budget on the fly, using inline editing. To do this, simply hover your mouse over the CPC or budget you’d like to edit, click the pencil icon, make the adjustment, and save! You can also adjust them using the campaign settings page, where you will have the chance to choose your bid strategy or change the budget type. Switching to the conversions mode bid strategy will allow the system to auto-optimize your CPCs to leverage the publisher sources most likely to convert. You can learn all about this feature here. While we offer various budget options, your campaign will default to a daily budget. Read on for a summary of all three types. Daily Budget: The default budget type. This is best if you have a fluid budget and plan to increase or decrease your budget in a timely manner. The daily budget represents the amount you wish to spend per day. After the budget is fulfilled, your campaign will stop being actively recommended, and your budget will refresh at 12am EST the following day. 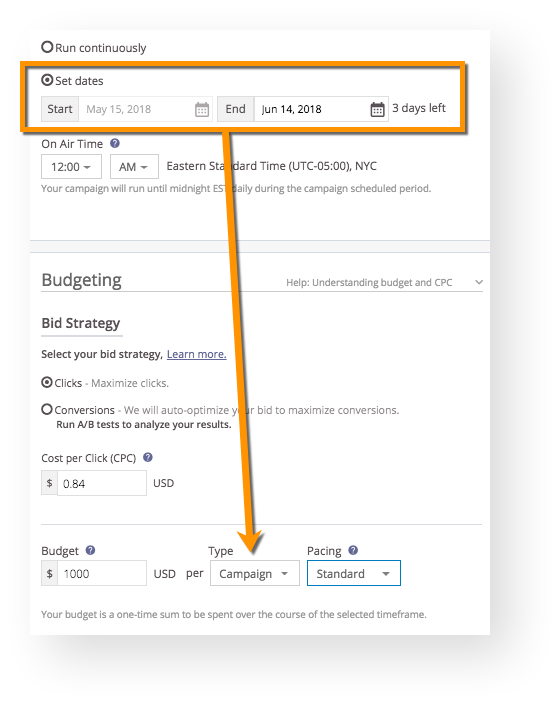 The only pacing option allowed for Daily Budgets is accelerated, which means your campaign will spend as quickly as possible until it reaches its budget each day. Keep in mind that the amount you spend each day may be up to 20% more than your daily budget. Monthly Budget: This budget type is best if you plan to spend the same amount each month and wish for it to renew on the first of each month. You must select a monthly budget of at least $600, as this equates to the minimum of $20 per day for the entire month. The pacing type will default to “Standard” – see below for a description of the different pacing types. No matter what day of the month you begin, it will reset on the first of the following month, and will continue to renew each month thereafter until paused. For example, if you start a campaign with a monthly budget of $600 on the 27th of the month, the campaign will attempt to run through the entire $600 in the three or four days left in the month, and then will renew on the 1st in order to spread the next $600 over the course of the following month. Campaign Budget: This type is best if you know exactly how long you would like to run your campaign, as well as the amount you would like to spend for that period. The campaign budget spans a designated time period and, unlike the monthly budget type, will not renew at the end of its duration. Again, it will default to the Standard pacing type (see below for more information). This option will only be available if you select start and end dates for your campaign; it will not save if you have set your campaign to run continuously. You must select an amount that is greater than the equivalent of $20 per day for the number of days you select. For example, if you wish to run a campaign budget of $50 for three days, the system will not let you save this, because the minimum for three days is $60. Read on to review the three pacing types available to you when deciding how to spend your budget. Standard: Our system will pace spending evenly until the end of the month. On days with less activity, our network will compensate by rolling over surplus budget and evenly distributing spend through the end of the month. This is best if you want to spread out your budget over the designated period, and is only available for campaign or monthly budgets. 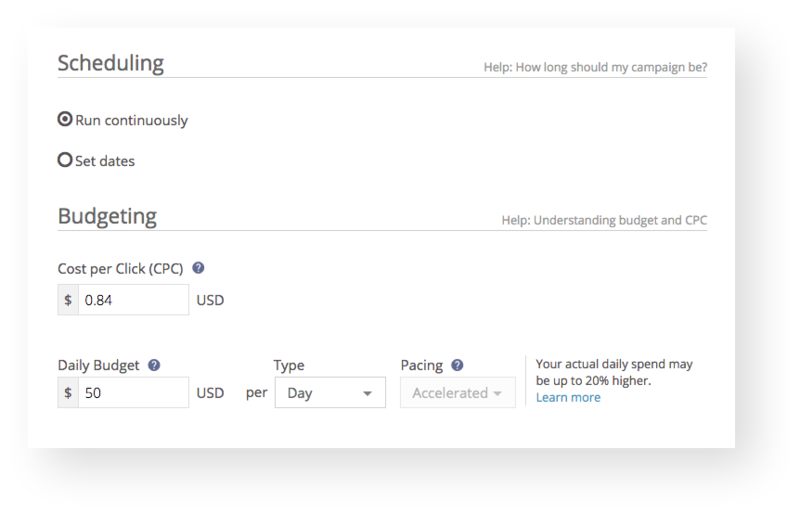 Accelerated: Your campaign will spend as quickly as possible, such that it may cap its monthly or campaign budget before the end date. At that point, the campaign would pause unless you decide to increase the budget to keep it running, or until the first day of the following month (if using a monthly budget). Please keep in mind that, using this option, you may spend your budget more quickly than expected. This is the only pacing available for Daily Budgets. Daily Target: You can designate a certain amount to spend each day from the monthly or campaign budget you set. This option is best if you know how much you want to spend each day, but want to take advantage of the campaign or monthly budget option. An example would be if you wanted to front-load the total budget before shifting the target down to slow the pace towards the end of the duration. Once you have created your first campaign, you will be charged in small amounts throughout the month, depending on how much you spend each day. You can learn more about our threshold billing system here. For any questions you might have, contact our Support team!